Today’s center consoles are more versatile than ever, with chameleon-like deck layouts that can be clutter-free and fishing-friendly one minute and filled with comfy seating and dinette tables the next. You can outfit the center console with as much fishing equipment or as many creature comforts as you like. Need three live wells? You got it. Cockpit grill? No problem. Air-conditioned console? It’s standard equipment. The center console has also become a showcase of technology, outfitted with everything from joystick helm control (see sidebar) to gyroscopic stabilization. These boats are now powered with second-generation 4-strokes that are lighter and more fuel-efficient, and that pack a stronger punch than their predecessors. The boats themselves are stronger and lighter, too, as more builders adopt higher-tech building methods such as resin infusion. Center consoles continue to get bigger and faster, allowing anglers to cover hundreds of miles in a single day. And they’re no longer just dayboats. Consoles have become so large they can now function as full-fledged cabins with berths, galleys and enclosed heads with showers. But the place to be on a center console is on deck, where you can fish from bow to stern, grill a steak or just sit back and enjoy the sea breeze. You can do all of the above aboard any of the boats featured here. While some production builders will hang only one brand of outboard, Wellcraft offers three: Yamaha, Mercury and Evinrude. 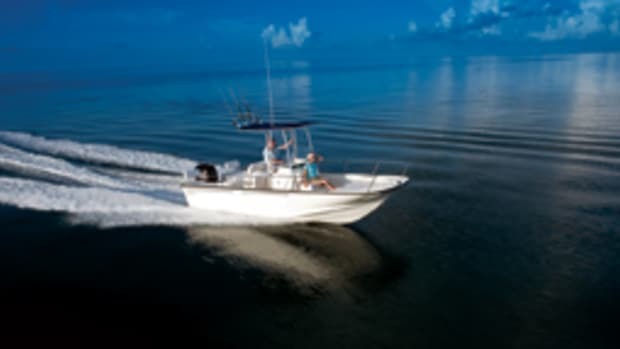 The largest center console in its Fisherman fleet, the Wellcraft 302’s deep-vee hull will get you to the fishing grounds and back quickly, without beating you up. It’s a fuel-efficient boat. 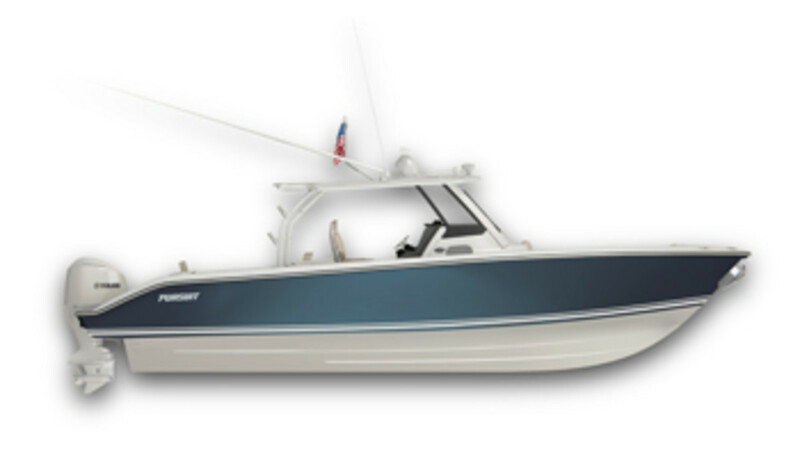 With twin 350-hp Mercury Verados, the Wellcraft gets 1.7 mpg from 29 to 36 mph and 1.5 mpg at 45 mph. 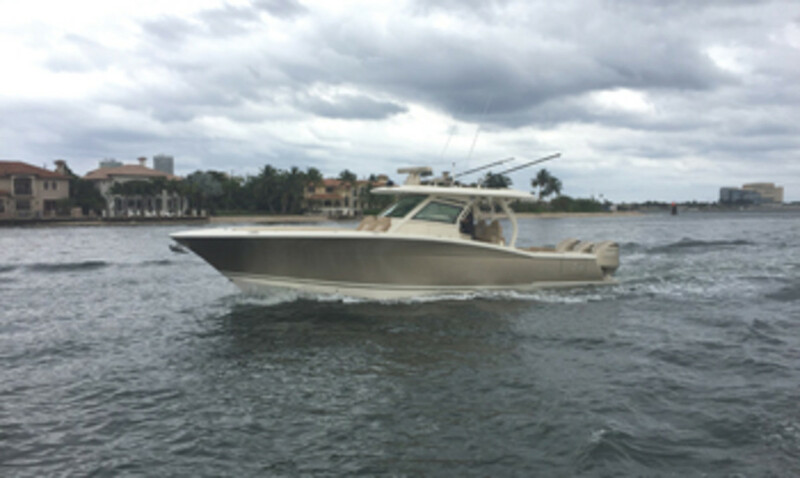 The 302 is outfitted with a smorgasbord of fishing equipment (27 rod holders, two 23-gallon live wells and four fishboxes with macerators) and day-cruising conveniences (cockpit grill, console head and sink, oversized forward lounge). The Scarab Offshore trim package gives the hull flashy graphics, a tricolor gelcoat, and upgraded helm and cockpit areas. Following on the heels of the S 408 that debuted last year, the S 328 is the lastest boat in Pursuit’s Sport series. “The boat is rugged yet refined, with more appointments than our other center consoles that are more utilitarian,” says Pursuit director of engineering Chris Gratz, referring to Pursuit’s standard center console fleet. The S 328’s strengths include an oversized fiberglass integrated hardtop and windshield that will protect you from the weather while maintaining clear sightlines, Gratz says. The console holds a head plus a two-person berth that converts to a dinette. The aft cockpit has foldaway fore and aft seats and two removable dinette tables. Wraparound bow seating complements the forward-facing console seat. 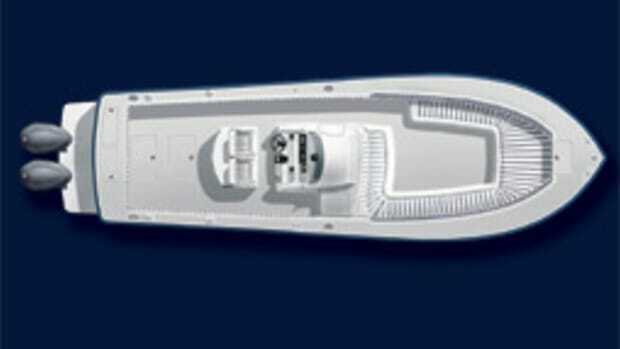 The hull is built with integrated transom extensions that allow easy access to the twin F300 outboards. 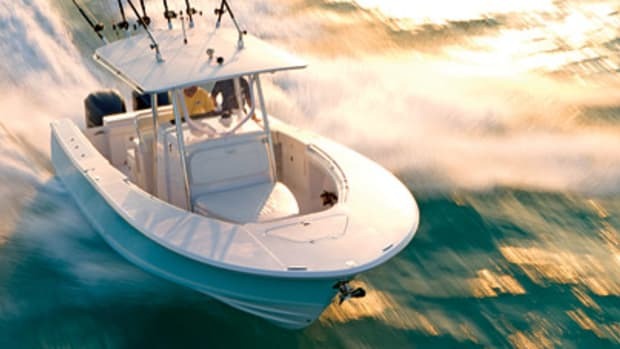 The Boston Whaler 380 Outrage replaces the 370 Outrage, which the company had built for the past eight years. 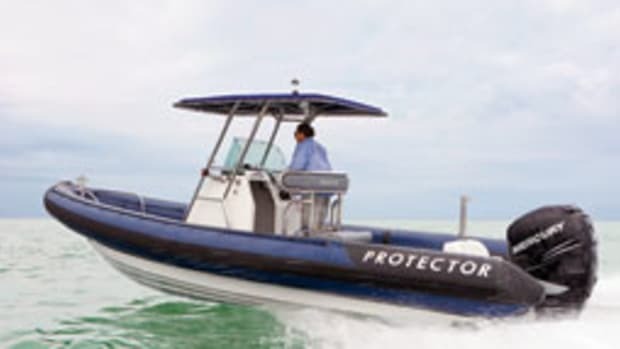 The 380 is a larger boat with better performance, thanks to more deadrise amidships (under the helm station) and larger trim tabs that are integrated with the hull, says Boston Whaler engineering manager Bobby Garza. The size of the console/cabin remains the same as on the 370, but Whaler has done a better job of using the interior space, says design manager Charlie Foss. The same goes for the deck layout. The boat has a leaning post bench seat that converts to a teak table (with four cup holders) and can be used for fishing or entertaining. 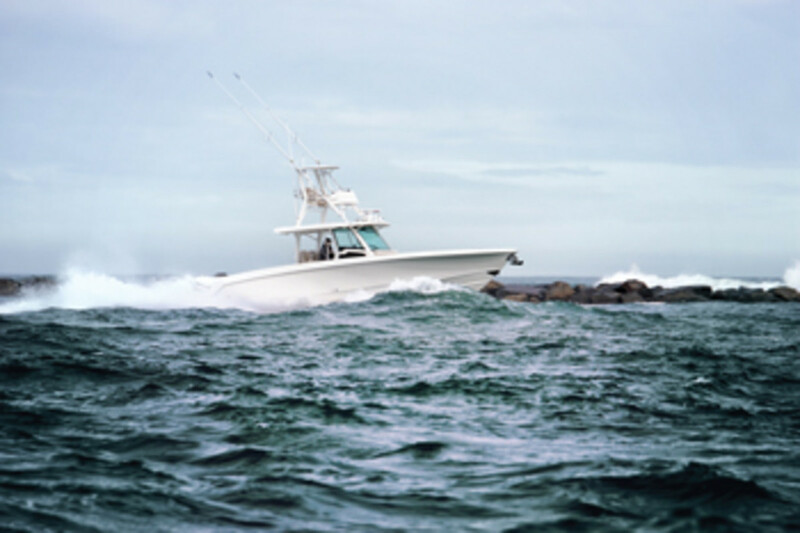 The boat has Whaler’s signature “bow garage,” a compartment under the bow seat that holds dive tanks and life jackets. The air-conditioned console has a lockable enclosed head and a V-berth that converts to a dinette. Upgrades include air conditioning on the helm deck and a gyroscopic stabilizer. The Scout 380 LXF runs on a high-tech, epoxy-infused stepped hull. 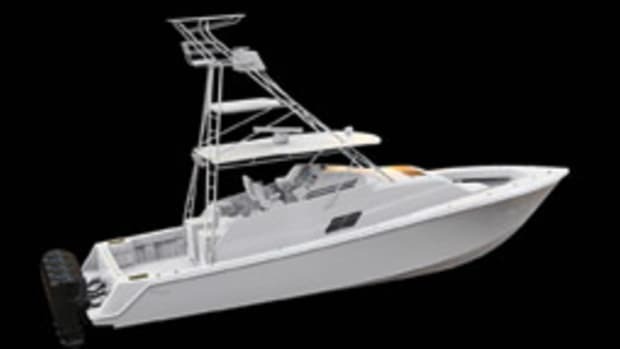 Scout is known for its on-deck innovations, and the 380 LXF has at least two of them. With the touch of a button, the grill, sink and cutting board (the “summer kitchen”) in the cockpit fold away and are replaced by a padded seat with a high backrest and a footrest. The other clever component is a rod holder rack on the hardtop that — under power — tilts down so an automatic SureShade awning can be deployed. The 380 LXF has seating and lounges with high-grade upholstery from stem to stern, but you can still fish this boat. Options include carbon-fiber outriggers, a tower with secondary helm and a 100-gallon live well. The air-conditioned cabin has an enclosed shower and head, a drawer refrigerator and a queen berth (6 feet, 5 inches long) that converts to a dinette. 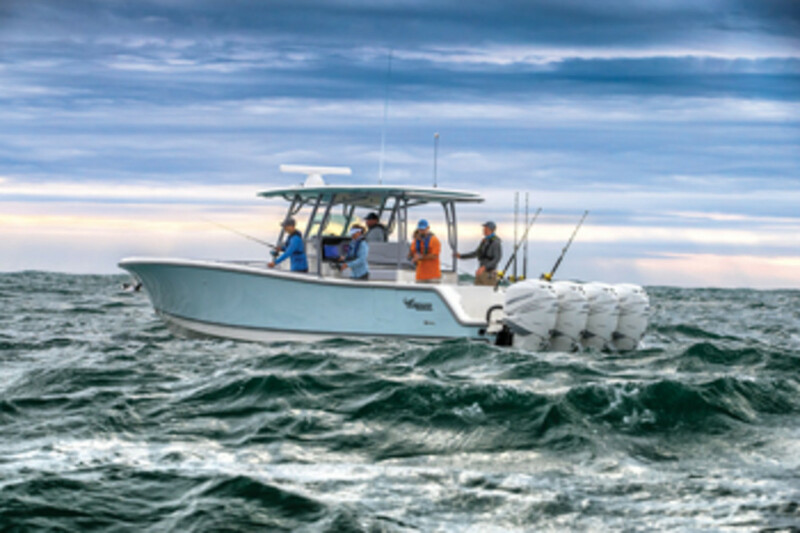 The new Stamas 392 Tarpon is a battlewagon center console built to fish hard and often. The 12-foot, 6-inch beam and turned-down lifting strakes and chines give the boat stability while running, trolling or drifting. “The boat planes perfectly with no bow rise, so you will never lose that horizon,” says sales manager Mark LaPrade. The Stamas also is designed to stay on plane at speeds as low as 16 mph, which is ideal for high-speed trolling. The 392 is built with more modern systems and conveniences, such as digital switching and a summer kitchen, than its predecessor, the 390. 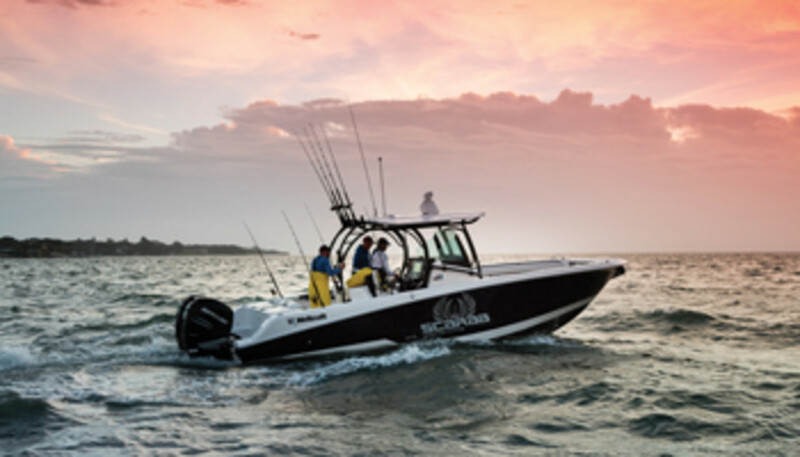 The largest center console from this family-owned company, the 392 also has a new hardtop design with a three-sided glass enclosure. She runs on a deep-vee bottom with variable deadrise (58 degrees at entry and 20 degrees at the transom). 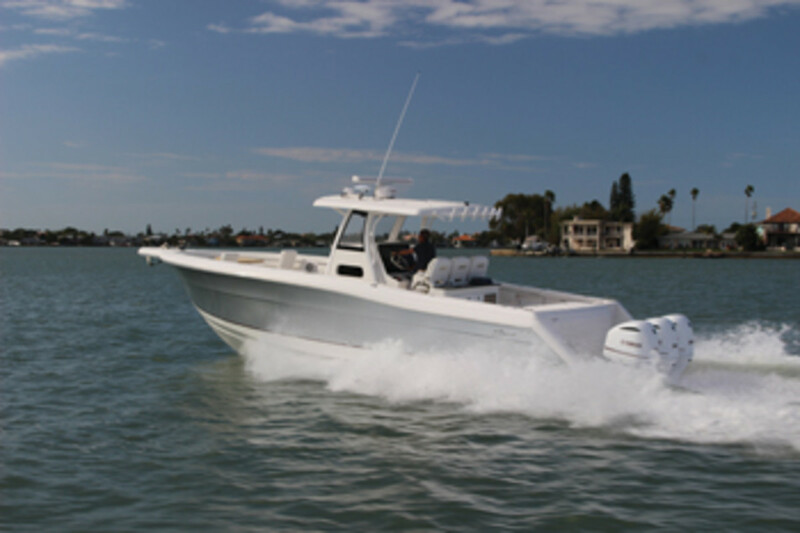 With the optional triple Yamaha F300s, the 392 gets 1.1 mpg at 36 mph — pretty good for such a big boat with 900 horses. The 414 CC is the largest boat Mako has ever built. She runs on a deep-vee bottom with a transom deadrise of 24 degrees. 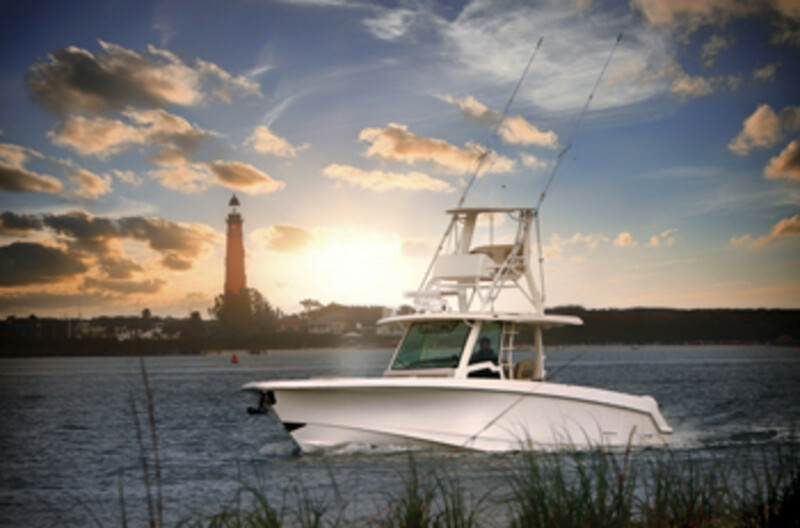 With four 350-hp outboards and a 566-gallon fuel capacity, the 414 CC is equipped to make long runs to the canyons or across the Gulf Stream to the Bahamas. At a cruise speed of 36 mph, the boat has a range of about 360 miles. The builder has equipment packages for fishing and cruising. The Bluewater Family Edition comes with a SureShade auto cockpit shade, Seakeeper gyroscopic stabilizer and bow dinette. The Sportfish Edition has an 80-gallon leaning post live well, extra rod holders and a live well system with tuna tubes (for keeping large bait alive). 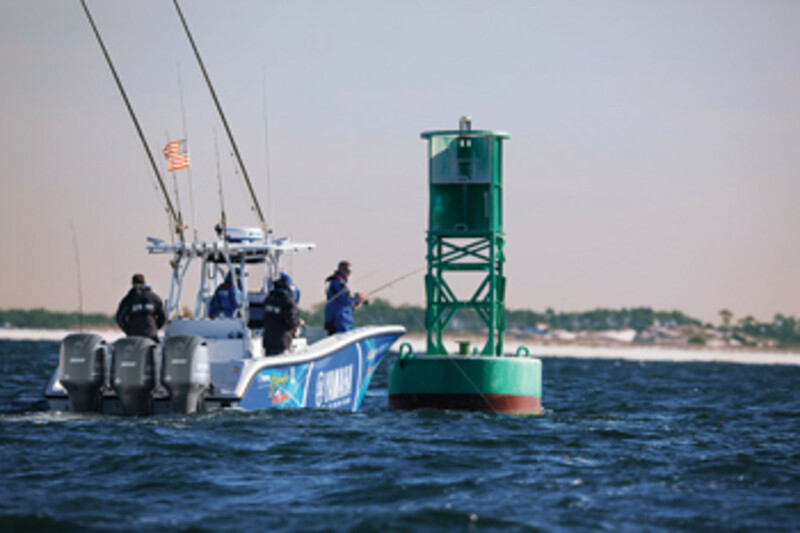 Anglers have another technological tool at their disposal for an even greater edge over the fish: GPS-enabled boat positioning systems. 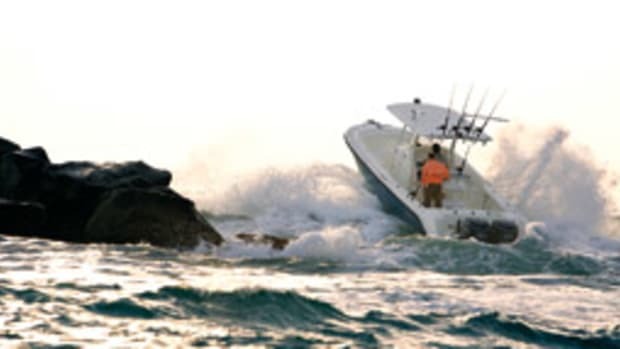 SeaStar Solutions is one of four companies that recently introduced a boat-control system tailor-made for anglers. 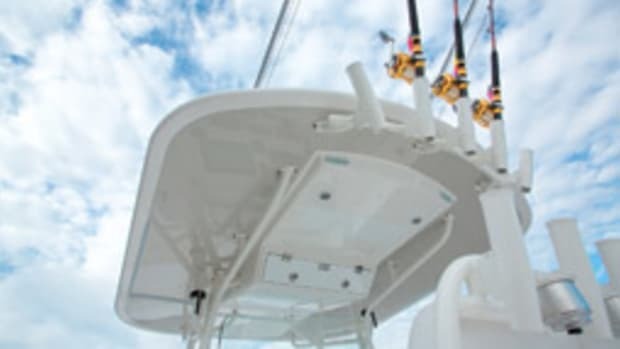 These systems upgrade the GPS station-keeping technology that has been available with most joystick boat-control systems, such as Mercury’s Skyhook and Yamaha’s Helm Master. The new engine-powered systems allow you to control the boat in three ways: by holding its position and heading simultaneously, holding its position (without a set heading) or holding its heading while drifting freely. SeaStar Solutions’ SeaStation GPS Anchoring System is an enhancement of its Optimus 360 joystick docking control. “Bottom line is you can spend more time fishing instead of setting up your fishing spot or drift,” Porter says. Outboard manufacturers Mercury and Yamaha also introduced similar systems. Yamaha’s Set Point is integrated into the Helm Master joystick. A dual GPS antenna feeds Helm Master the navigational information it needs for precise control, says Martin Peters, Yamaha’s communications manager. Precise control is what Mercury’s Skyhook Advanced Features is all about, says Lee Gordon, Mercury director of public relations. “You can adjust the heading lock in 1- and 10-degree increments while Skyhook is active,” he says. This article originally appeared in the May 2017 issue.